From Lakes to the Ocean, Enjoy the Best Fishing in Costa Rica. This package showcases all the main highlights of a vacation in Costa Rica: volcanoes, thermal hot springs, rainforests, amazing wildlife, beautiful beaches, and, of course, world-class sportfishing. Split your time between the Arenal Volcano and the Pacific Coast so you can see all that this beautiful country has to offer. The first hotel in this package is the Arenal Nayara. Voted one of the most romantic hotels in the world and complete with lush landscaped gardens, Jacuzzis dotted around the grounds, and stunning rooms decorated with local fabrics and art, Arenal Nayara is a perfect base for your adventures around the Arenal Volcano and La Fortuna area. You’ll start your time in Costa Rica with a relaxing walk above the clouds in hanging bridges above the rainforest, finishing up in some of the country’s best hot springs. Then try Costa Rica’s famous zip lining experience, flying from tree to tree above the rainforest! There are also a number of other tours you can do around La Fortuna, from jungle hikes to white water rafting, if you prefer. Lake Arenal sits in the shadow of the volcano, and here you can enjoy kayak fishing for bass and tilapia. 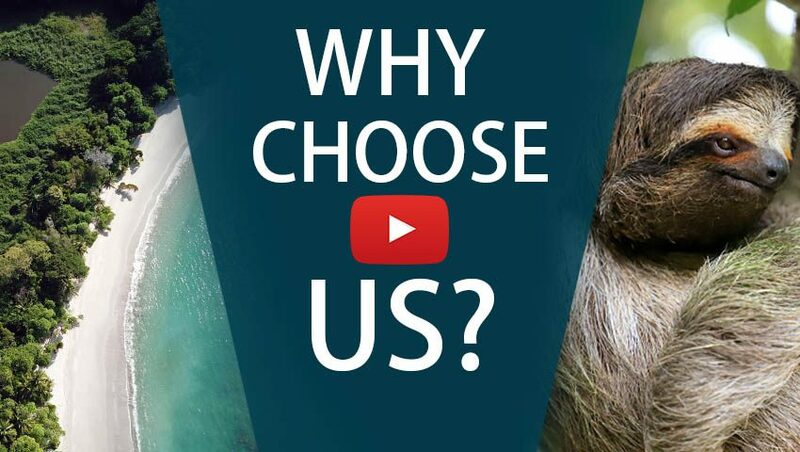 From Arenal, we take you to the coast and the famous resort of Manuel Antonio. From here you can enjoy some of the best off-shore fishing in the world. 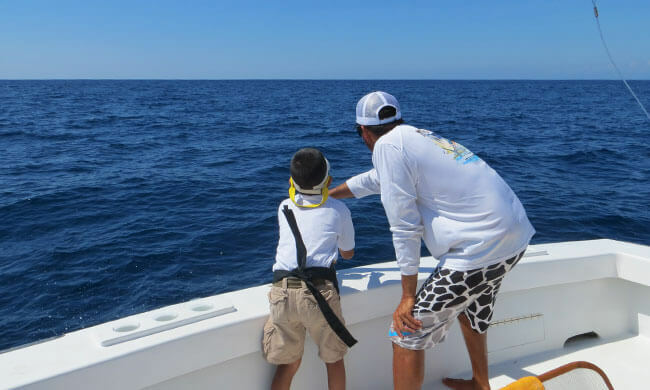 The blue waters are home to marlin, sailfish, dorado, roosterfish, tuna, and more. Cast your lines and good luck! 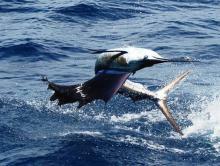 This is your first day in your Costa Rican Fishing Highlights vacation. Fly into San José, Costa Rica, where you will be met inside the airport and taken right to your waiting private transfer. We’ll take you three hours north to see Costa Rica’s biggest and most popular volcano, Arenal. Here you’ll stay at the amazing Arenal Nayara where you’ll have breathtaking volcano views right from the private Jacuzzi in your room. Rated the #1 hotel in Arenal and the “most romantic hotel in Central America”, you can be sure this will be a stunning welcome to Costa Rica. You will be picked up early in the afternoon for the first part of your combo tour – the popular Hanging Bridges. Suspended along the rainforest, the bridges cover more than 3,100 meters during this three-kilometer hike. This will give you a up close and personal view of the incredible flora and fauna in Costa Rica. You’ll end your day with a buffet dinner and a few hours to soak in the world famous Tabacón Hot Springs. 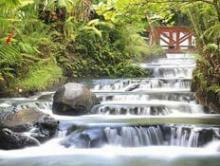 Heated by the magma in the Earth’s core, these natural springs range from 77 to 103 F.
Arenal is referred to as the “Adventure Sports Capital of Central America,” and today you will be taking full advantage of its reputation with a zip line tour. Take a tram trip on your way up and then soar over and through the rainforest as you effortlessly glide on a series of cables. Late in the morning we’ll pick you up and take you from the Arenal Volcano down to the Central Pacific Coast and Manuel Antonio. This is one of the most popular and most gorgeous areas in the country with its national park, lush rain tropical rainforest, and beautiful beaches. Here you’ll stay at the beachfront Arenas del Mar hotel. This is one of the top hotels in Costa Rica and the only hotel in Manuel Antonio with direct access to two beaches. With just 37 rooms and an impeccable reputation, this is one of the most popular hotels in the country. This day is yours to relax and enjoy the afternoon at the hotel. Time to go fishing! You’ll head out on your private fishing boat for an unforgettable day on our cobalt blue waters. Manuel Antonio has always been the main fishing destination in Costa Rica because fish can be found within 20 miles from the brand-new marina. You’ll spend this day chasing trophy billfish like striped, blue, and black marlin along with our giant Pacific sailfish and tasty dorado. If you are lucky you’ll find yellow-fin tuna or wahoo! 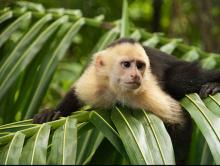 Relax and enjoy the beach or check out the incomparable Manuel Antonio National Park. Inside you’ll be sure to see white-faced Capuchin monkeys, iguanas, sloths, and, of course, walking trails and three beautiful beaches. Day 7—Now it’s time to see what the in-shore fishing brings you. Troll near the rocky islands or above the reefs with live bait for jacks, barracuda, grouper, snapper, mackerel, and our famous roosterfish. Or if the conditions and tide are right, you can go into the river mouths and try to land a snook for dinner! Day 8—We will pick you up and take you to the Quepos Airstrip so you can board your domestic flight for a 25-minute flight back to San José. The best hotel for romance, the Arenal Nayara Hotel is an ideal choice for couples who seek luxury and sophistication. Manuel Antonio, often referred to as the 'fishing capital' of Costa Rica, is the launch point for some of the best fishing in the world. Enjoy fantastic freshwater fishing in one of the most scenic and surreal settings you may ever be in - Lake Arenal, the largest in Costa Rica! Indulge yourself in peacefulness. First in the clouds and then on the coast, these destinations have everything you'll want for a relaxing getaway.